THE QASHQAI is the best-selling urban crossover in Europe, bar none. Fresh from significant upgrades to its looks, interior quality and driving performance, along with innovative technologies such as ProPilot autonomous drive, there's much to recommend it  not least that it's built here in Great Britain, at Nissan's Sunderland plant. So, Deal or No Deal (Brexit), you'll always be able to buy one. 'Tech' is a big pull and the hottest feature at the moment has to be autonomous driving. Nissan is already well advanced down the self-driving road and its ProPilot semi-autonomous technology is now available on the Qashqai. While other carmakers offer similar systems, the Nissan's is more polished, scoring well for ease of use while taking the strain out of long journeys, particularly motorway ones. Nissan is rolling out ProPilot first on the aptly named Pilot One Edition dci 130. Finished in lustrous Storm White pearlescent paint, it looks like a machine you'd want to fly in. Fronted by a sharply-creased clamshell bonnet and the brand's signature thrusting V-Motion grille framed by sleek full-LED headlamp clusters, this latest take on the Qashqai now measures 4.4 metres nose to tail. The smooth-flowing flanks are interspersed by attention-grabbing diamond cut 19-inch alloy wheels; 'kicked-up' rear shoulders are topped by an athletic coupe-look glasshouse with a spoiler and shark-fin antenna. 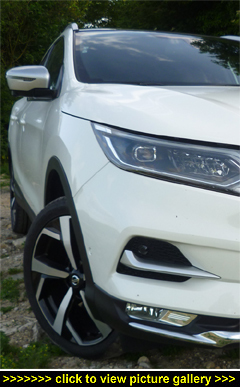 At the back are neatly integrated wraparound 'boomerang'-style LED taillights but from whatever angle you view this latest-generation Qashqai, it's got premium kerb appeal. Under the dci 130's bonnet beats a muscular 1.6-litre four-cylinder turbodiesel, and in the Pilot One Edition it comes partnered with Nissan's Xtronic CVT auto (with a handy manual override). While oil-burners have had their fair share of bad press of late, there's still plenty to be said in their favour  namely plenty of torque and flexible power delivery. Whether you suddenly need to up the pace or just pull safely past some slower traffic the 128bhp dci feels nicely willing courtesy of its 236lb ft, fully on song from 1,750rpm. Motorways can be cruised with total ease, made even better by its quiet and refined gait at (and beyond) the UK's legal limit. Pin the accelerator and you'll hear it growl but it's a reassuring soundtrack that in everyday driving you really don't notice. For fuel-conscious drivers there's an Eco mode  we rarely used it but still managed 44.4mpg during a hard week's test driving. Without doubt the average driver will do better, and should see the smiley side of 50+mpg. Crossovers market themselves on the basis of having the driving dynamics of a well-proven hatchback  but not all do. The Qashqai, thankfully, does. Retuned dampers and increased anti-roll bar stiffness ensure it's an even better handling car than before; one that drives fluently and can be punted about when the mood takes you. The electric speed-sensitive steering also offers a choice between Normal or Sport weightings. Front-wheel drive is the default set-up but if you feel you really do need drive to all four wheels then 4WD is available on the dCi 130 turbodiesel with the manual six-speed stick shift. Most of the time, though, you'll be more than happy with its reassuringly relaxed manners (backed by a host of safety systems including Nissan's Safety Shield with Forward Emergency Braking, Driver Attention Alert, Intelligent Emergency Braking with Pedestrian Recognition, and Intelligent Park Assist) that let you simply get in and drive, leaving the Xtronic automatic transmission to take the sting out of today's often tedious and trying driving conditions. And then, of course, there's ProPilot. And it couldn't be easier to use  simply press a single button on the steering wheel when travelling at more than 37mph and, like its smarter-than-average adaptive cruise control and it will maintain a set distance from the car in front while automatically inputting subtle steering adjustments to keep you within your chosen lane and braking oh-so-smoothly when the traffic ahead stops or another vehicle cut in ahead of you. If you want to change lanes just indicate in which direction and the system then ups your speed although you still have to physically steer while crossing into the adjacent lane. To do its self-driving business it uses three onboard technologies; Lane Keep Assist, Intelligent Cruise Control and Traffic Jam Pilot as well as using information provided by its camera and radar that constantly scan the road ahead. What ProPilot doesn't let you do  at least not yet  is lean back, link your hands behind your head and close your eyes as the miles waft by because this is still a 'hands and eyes on' technology: take your hands off the wheel for more than a few seconds and you'll be warned audibly and visually to put 'em back  don't and you won't go into the naughty corner but you will feel equally embarrassed when ProPilot then brakes the car to a perfectly controlled stop (as it also does whenever the traffic in front comes to a halt). No doubt many drivers would like it to do more but even so ProPilot takes a huge amount of stress out of long motorway trips, particularly in its experienced-driver-level anticipation and reassuring sang froid even when, for instance, a carelessly driven car overtakes you and slews back in too close to your nose (as too many do). From the comfort of their seats, passengers will quickly appreciate the Qashqai's agreeable ride, made even more soothing by the admirable body control over larger bumps and all degrees of blacktop thanks to the car's Active Ride Control system  something which also benefits the handling when in press-on mood. Building on the already feature-rich Tekna+ specification, the Pilot One Edition comes with all the bells and whistles along with some very smart monoform sports seats with supportive bolstering that not only contribute to a commanding driving position (with a decent view down the bonnet) but, upholstered in Plum-coloured soft Nappa leather with some flamboyant 3D quilting on the centre panels, are particularly comfy. Both front seats are power-adjustable and have two-stage heating; the driver also gets an easy-entry facility that powers the seat back for hassle-free exits and forwards again to your last used position once you thumb the Start Engine button, a seat/mirror memory recall, and four-way power lumber as well as a sporty, flat-bottomed steering wheel with a satisfyingly meaty leather rim. As well as being seriously multifunctional, with intuitive controls for the multifunction driver's trip display  set between the clear white-on-black dials  and the likes of the cruise, speed limiter, infotainment, etc, that make for minimal 'eyes off the road' time, it also houses that all-important ProPilot button. Even a tall front passenger will be able to stretch out without cramping those sitting behind while enjoying a fist-and-a-half of headroom. Further enhancing the roomy cabin's ambiance is a panoramic glass roof (with a one-shot shade) along with a tastefully upscale dash treatment boosted by carbon-effect trim and satisfying upmarket fit and finish. Entertainment is very well served by an all-new eight-speaker Bose premium sound system that features two 25mm tweeters at the base of the windscreen, a 165mm woofer in each front door and a 130mm mid-range speaker in each rear door. Two further 115mm woofers are housed in a 7.7-litre custom-engineered enclosure mounted in the spare wheel well, plus there's a BOSE digital amplifier with eight channels of custom equalisation and digital signal processing for clarity of acoustics and minimal distortion at higher volumes to create a concert-like listening experience. Should you prefer, you can instead listen to the DAB digital radio or go on the web using Nissan's Connect touchscreen infotainment and navigation set-up that benefits from a smart new user interface  now more intuitive thanks to a more app-like appearance. The navigation is �ber-friendly with fast full postcode destination entry. Naturally there's Traffic Sign Recognition displaying the posted limit immediately above your actual digital readout where you can't miss it between the main dials and where a host of critical driving information can be shown according to your personal priorities. And when it comes to swallowing bits and bobs the cabin lives up to it' family-friendly billing with large dual-usage cupholders and an adjacent open bin with another lidded storage box in the central tunnel, plus a large glovebox with a damped lid. Parking is something that many motorists love to hate but let the Qashqai's automated Intelligent Park Assist take over and tight spots become something you actually look forward to. Even doing-it-yourself is a doddle thanks to the Intelligent Around View Monitor that uses four colour cameras to deliver 360� views making reversing and parking so much easier. Other essential kit includes keyless entry and locking (on the front doors and tailgate) along with keyless start, dual-zone climate control, electric parking brake, privacy glass, ambient cabin lighting, heated powerfolding door mirrors (on-demand and automatically on locking and leaving), auto-dimming rearview mirror, one-shot power windows front and rear (with remote global opening and closing), handsfree Bluetooth with audio streaming, front and rear parking sensors, and aluminium sports pedals. Safety kit is comprehensive with a full suite of driver 'assists'. Chief amongst these are Intelligent Emergency Braking (now with Pedestrian Detection that helps to avoid or mitigate collisions with foot-traffic using a combination of forward-facing radar and a camera), Moving Object Detection (when using the Intelligent Around View Monitor, the system warns you if something is moving around the vehicle), Intelligent Cruise Control, Traffic Jam Pilot, Rear Cross Traffic Alert that warns of traffic crossing behind when you're reversing, Lane Departure Warning, Lane Keep Assist, Intelligent Lane Intervention, and Blind Spot Warning. Other equally useful features include intelligent chassis control with active ride control and an electronic stability programme, adaptive LED adaptive front lighting with dynamic cornering lamps, signature LED daytime running lights and rear lights, automatic self-levelling headlights, a heated windscreen, tyre pressure monitoring, intelligent driver alert, automatic headlights and wipers, tyre pressure monitoring system, height-adjustable front belts, six airbags and a five-star Euro NCAP safety rating. The Qashqai's cabin is good for singles, couples, triples, quartets and even five-strong family units. Back cabin headroom, legroom and foot room is fine for adults, with well-padded seats and backrests set at a relaxing angle, and the upscale ambiance is made even better by that huge full-length glass roof (as already mentioned, there's a powered 'blackout' sunblind for the times you or your passengers aren't in a sun-worshiping mood). While views of the sky are first-rate, views to the front and side are equally expansive, helped by the tapered shoulders of the front seats and the fact that you it bout six inches higher than those in front. Those with youngsters will be glad of the Isofix child seat anchorage points on the outer seats as well as the remote rear occupant's seat belt monitoring. Magazine pockets, usable door bins and a comfy drop down centre armrest with built in cupholders add the finishing touches to what is a genuinely soothing place in which to travel. An enduring part of the Qashqai's appeal is its passenger and cargo versatility  fold down the 60:40-split back seats and the 401-litre boot expands to a very accommodating 1,569-litre loadbay with a completely flat and seamless floor. You also get Nissan's clever Luggage Board system with dividers than can be used to partition up the cargo area in sixteen different ways to best suit whatever it is you need to transport. Another practical touch is the reversible finishes on the multi-configurable luggage boards: carpet on one side; a wipe-clean finish on the reverse. More good news: when not required the rigid lightweight luggage cover stores neatly away under the boot floor. Further adding to the Qashqai's multi-usage credentials is its ability to tow a braked 1,400kg.